Issues of tourists’ safety are gaining grounds in Ghana especially in the Ahanta West District in the Western Region where Ghana discovered commercial crude oil in Cape Three Points in 2007 and started drilling in 2010. 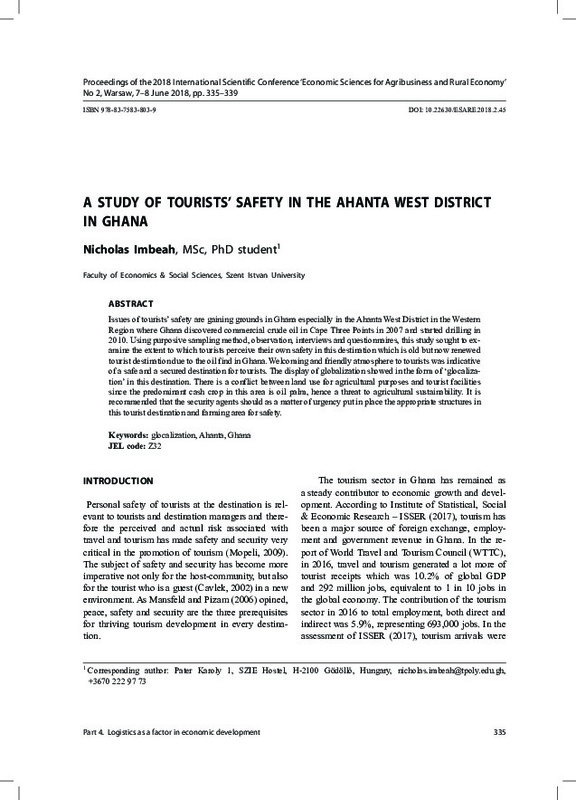 Using purposive sampling method, observation, interviews and questionnaires, this study sought to examine the extent to which tourists perceive their own safety in this destination which is old but now renewed tourist destination due to the oil find in Ghana. Welcoming and friendly atmosphere to tourists was indicative of a safe and a secured destination for tourists. The display of globalization showed in the form of ‘glocalization’ in this destination. There is a conflict between land use for agricultural purposes and tourist facilities since the predominant cash crop in this area is oil palm, hence a threat to agricultural sustainability. It is recommended that the security agents should as a matter of urgency put in place the appropriate structures in this tourist destination and farming area for safety.